The Pixel 3 XL may have just leaked with a notch and glass back. Let's discuss. By this point, it seems pretty clear the Pixel 3 XL will include a notch. Android P includes native support for notches, a leaked screen protector shows a cutout at the top of display, and a Bloomberg report practically confirms it. Now we’re getting what appears to be the first look at the device itself, courtesy of a post on by meraz9000 on XDA. A necessary disclaimer: this is an uncomfirmed leak of a prototype. For all we know, this could be one of several test designs, and the device could change between now and its expected announcement in the fall. But I’ve also covered tech long enough to know these early leaks come to fruition perhaps more often than not, and it perfectly matches prior leaks. First things first, the notch. It’s there, and I expect it to stick. But it looks kind of… chunky. Most other Android phones have a short notch that’s easy to hide in software – on the OnePlus 6 and Huawei P20, it’s hardly taller than the status bar – it becomes practically invisible when hidden in the software. The tall notch will probably mean an expanded status bar – like on the Essential phone – and an unfortunate waste of precious space. Huawei’s notches on the P20 Pro (left) and P20 (right) are small and inconspicuous when hidden in the software. 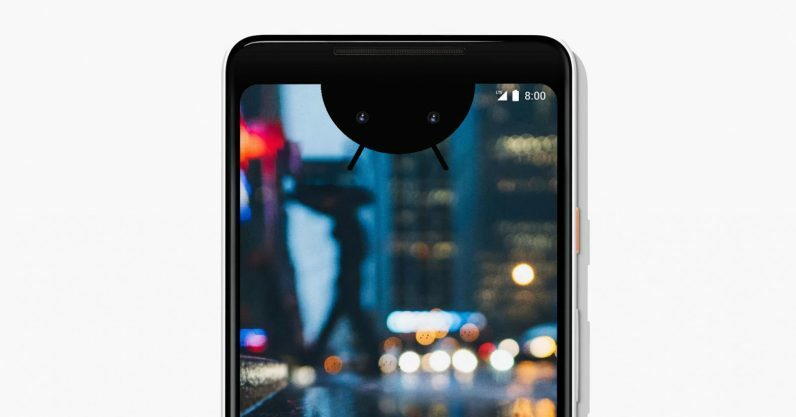 On the plus side, there seem to be two cameras on the front (or at least an extra sensor), something previously indicated in a Bloomberg report last week This could be used for more accurate depth perception for portrait mode. But the Pixel 2 already has arguably the best selfie portrait mode outside of the iPhone X, so that seems kind of superflous. A more intriguing possibility would be that it could enable something like Apple’s Face ID. Plenty of Android phones already include face recognition, but they are almost always far less secure than Apple’s system – more of a convenience than a real security solution. The OnePlus 6 has one of the fastest face recognition systems around, for instance, but it can be fooled with a photo and isn’t secure enough to be used for things like Android Pay. Samsung does have an actually-secure iris scanner, but it tends to fail in daylight and is much more finicky than Face ID. I’m not sure Google could match Apple on this front with just two sensors, but the company has surprised me before. This looks like an autofocus sensor, but that’s not an area the Pixel 2 has been lacking in. There seems to be a new sensor on the back as well, sandwiched between the flash and the primary camera. But I’m surprised Google didn’t go the dual-camera route; it’s weird for it have two cameras on the front and only one on the back. Even if it doesn’t need it for portrait mode, I would’ve loved a wide-angle or telephoto lens in addition to the main shooter. Then there’s what appears to be a glass back. Emphasis on the appears, because it could just be metal with an interesting texture, but the way the texture changes near the top of the phone makes me think not. If that pans out, I really hope the Pixel 2 has wireless charging, because I’m absolutely tired of phones with glass backs for no reason other than to be trendy (wireless charging doesn’t work through metal). The Huawei P20 Pro and OnePlus 6 manage to be great phones despite the lack of wireless charging, but make no mistake: glass is terrible choice of material for a phone’s body. It can be beautiful if done creatively, as with the P20 Pro’s gradient colors, but there’s no need for almost every flagship to use a glass back. Besides, I’m quite fond of the matte metal on the Pixel 2. Huawei’s P20 has a beautiful glass back, but it’s still an impractical material. Worse, some of these changes strike me of Google playing copycat to Apple – as with last year’s removal of the headphone jack – for no good reason. The notch I kind of get – it’s the best way to optimize screen real estate, given current technology – but I wish the compay would’ve been a more subtle about it. But then, take my negativity and skepticism with a grain of salt. I was similarly negative when last year’s models leaked – “the bezels are so big, and there’s only one camera!” – but the Pixel 2 is still my favorite Android phone on the market eight months later. For now though, I’m still conflicted. What do you think about this leak?